SOUTHINGTON - Baseball is full of peculiar superstitions and random oddities. Many believe a player who makes a great catch in the field is sure to be leading off at the plate the following inning. Others are convinced a team which escapes a tight jam almost always responds with an offensive outburst to make the opponent pay for its lack of opportunism. The Southington boys baseball team is a believer in the latter after its 8-1 win over Berlin on Tuesday afternoon. 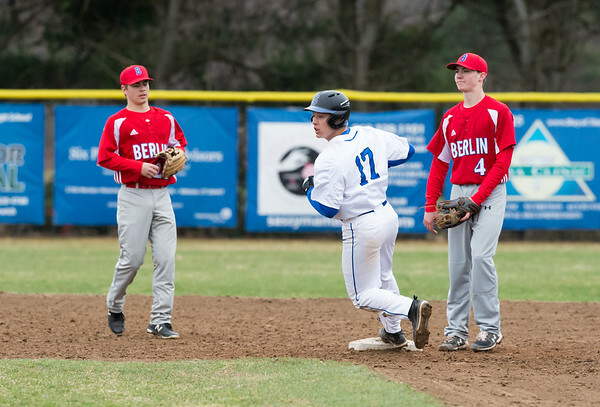 The Blue Knights (3-0) committed three errors in the first two innings, including two in the second to load the bases for the Redcoats (4-1), but Berlin stranded the bags full to set up a hit parade for Southington in the form of three-run third to set the tone for the game. Lembo likely doesn’t require an answer to baseball’s funny riddle, rather he’s just happy it showed itself on Tuesday, when Jack Meade’s triple in the third plated Jake DelMonte to spark the scoring for Southington, who beat Berlin for the third year in a row. Meade finished the afternoon 3-for-4 at the plate with three RBI, while starter Jake Neuman cruised through five scoreless after escaping the second-inning jam. A leadoff single to Gianni Fanelli was the only hit he surrendered all game. The Redcoats stranded four runners through the first two innings, then failed to put a runner on base until the sixth inning, when the Blue Knights had already built a 6-0 lead. “We started off slow today, but after the second inning, we got the job done at the plate after we settled down.” Meade said. Meade’s triple, a liner drive down the right field line, gave Southington the lead in the third before Neuman dribbled a slow roller to third, where Berlin’s Jeff Kuzoian came up firing and nabbed Meade at the plate for the second out. Redcoats’ starter Adam Bilinsky then came one strike away from minimizing the damage before Jake Romano punched an RBI single to right to keep the line moving. After the Blue Knights loaded the bases, Bryce Worth ripped a hard single off the glove of Kuzoian to plate Neuman and give Southington three runs in the inning, peppering Bilinsky for four hits and a pair of walks to chase the righty after three innings of work, after he went the distance against Wethersfield on Thursday. Worth went 2-for-3 with an RBI. Nick Accarpio took over for Bilinsky in the fourth, but the Blue Knights bats stayed hot, as Meade started with a single before advancing to third on a stolen base and a passed ball. Billy Carr drove in Meade with a line drive single up the middle to put Southington ahead 4-0. Meade continued his sparkling day in the fifth, driving in two with another single to break the game open and give the Blue Knights a 6-0 lead. Through five innings, Meade accounted for half of Southington’s offense, driving in three in four at-bats. With Neuman out of the game after five innings of one-hit ball, the Redcoats ended their offensive slump in the sixth against reliever Nico Gaudio. Dan Veleas led off with a walk, and back-to-back singles by Ryan Hyde and Paul D’Amore scored Veleas and put runners on first and second with nobody out. But the potential comeback was squashed when Tom Hyjek bounced into a 4-6-3 double play, followed by a hard lineout off the bat of Kuzoian to keep Southington in control. The Blue Knights got more insurance in the bottom of the sixth, ripping three straight singles to take an 8-1 lead, the third base hit coming off the bat of Tyler Strong to drive in a pair. Southington, which recorded multiple hits in each of their final four innings, looked back to the second inning jam when asked about its sudden surge of offense. Posted in New Britain Herald, Berlin, Southington on Tuesday, 9 April 2019 21:02. Updated: Tuesday, 9 April 2019 21:04.